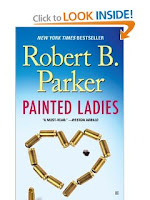 There are certain authors I can't wait to read, and Robert B Parker and his Spenser novels are (were?) long time faves. 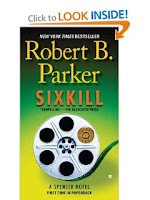 On Tuesday I picked up his last two Spenser books: Painted Ladies and Sixkill. By Thursday afternoon, I had finished both books. novel completed by Robert B Parker." I was really sad to hear of his death when it happened, thinking that I'd have no more chances to get together with an old friend. I do wonder though how many works-in-progress may be lying around... might there be another installment or two in the Spenser series? Forty Spenser novels have been published, and I've read them all, and loved most of them (let's be honest, one or two of them were clunkers). Sixkill, the 40th, was one of the best ones, although this book (and Painted Ladies, #39) did not feature Hawk, Spenser's right hand man. Instead, Spenser flies solo (professionally) in Painted Ladies (given the plot and setting, this is (was) no big deal ... Hawk wasn't in every book), and in Sixkill, he takes on, shall we say, an apprentice named Zebulon. bodyguard. He loses the job and ends up being sort of mentored by Spenser. Z comes across like a young Spenser: a drinker and a fighter with a sly wit. The absence of Hawk in the last two books, along with the introduction of Zebulon Sixkill, makes me wonder what plans Parker had for his series and his characters. I would have liked to see more of Z (and there's no "goodbye" to him in Sixkill...), but I was starting to miss Hawk. According to Wikipedia (yeah, I know, it's not the best source) there is another as yet untitled Spenser novel due in 2012. I am dying to read it. I want to see which right-hand-man (or men) is in it. Will Z and Hawk meet? (That would be cool!) And who is going to finish the incomplete manuscript? (Big shoes to fill for whoever does it). And are there outlines or synopses for additional Spenser novels? I certainly hope so... I hate goodbyes.